Welcome to the paradise! 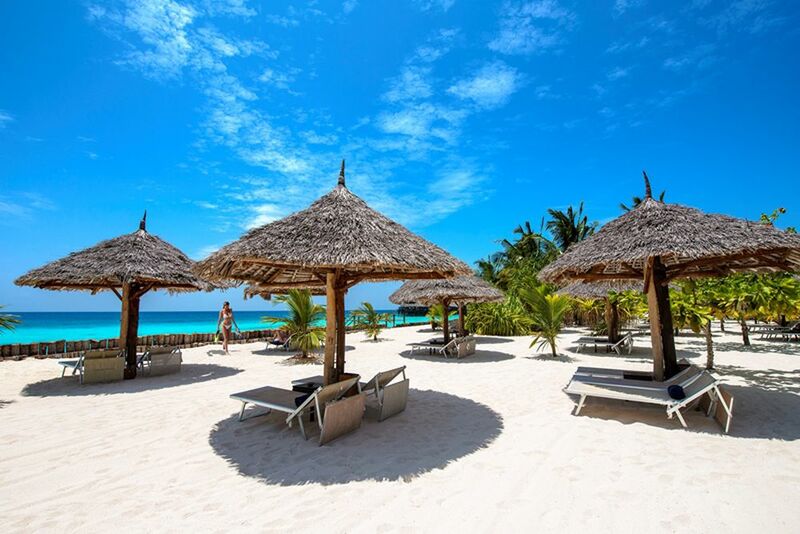 You will surely spend the best time of the year here in Zanzibar. Located in wonderfully lush gardens, you can simply let your soul drift and your mind wander. The modern rooms will fulfill all your wishes. 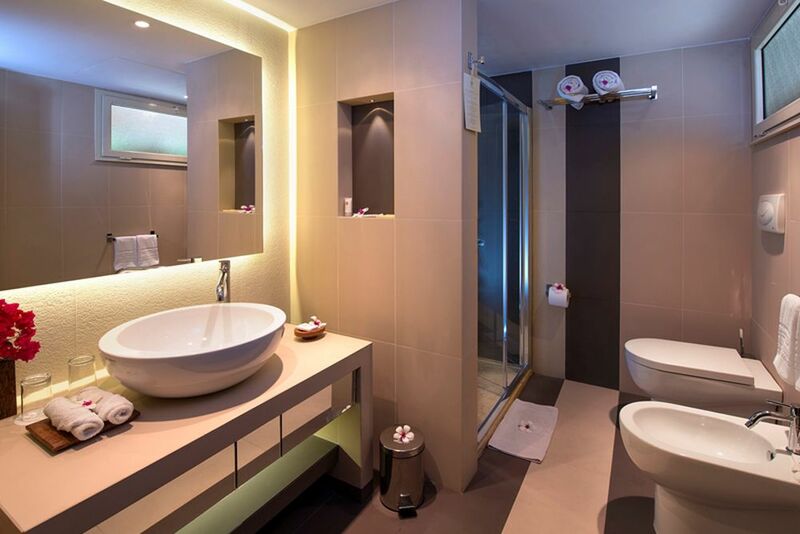 The luxuriously equipped bathroom ensures a fantastic start into the day. Lean back and relax in front of a dream-like landscape. The snow-white sand is only a couple of steps away from your room. Pure relaxation! Indulge in relaxing time-out at the snow-white beach. Look forward to a romantic evening atmosphere. Wake up in a dream-like setting, surrounded by white sand beaches, tropical gardens and a luxurious resort. 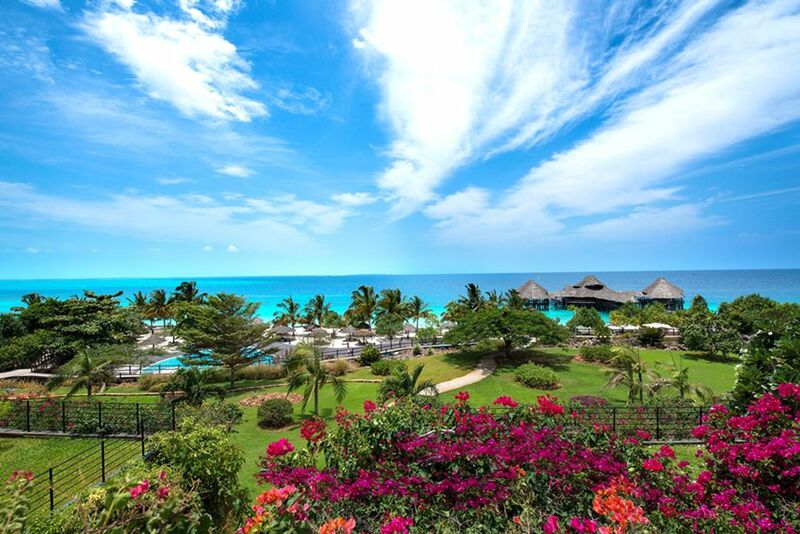 Diamonds La Gemma dell’Est boasts stunning views of the Indian Ocean and pampers its guests with an attentive staff, soothing spa treatments and the finest delicacies. Discover a heavenly oasis located 50 km off the eastern coast of Tanzania, where the island not only offers breathtaking mature and scenery, but also countless activities and excursions that allow you to immerse yourself in the local atmosphere and traditions. Bask beneath the warm sun on the snow-white beach, or relax amidst an exotic garden where the lush greens transcend toward several waterfalls. 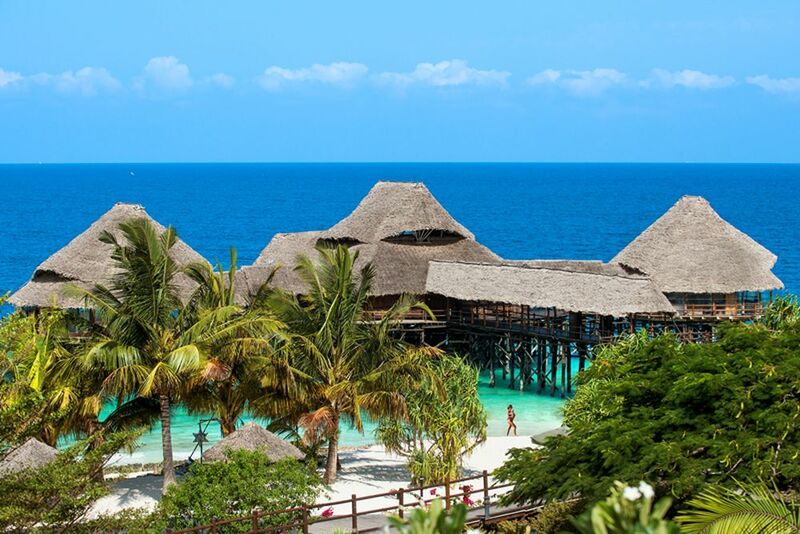 The island of Zanzibar is an extraordinarily beautiful place from the naturalistic point of view and was, for centuries, a crossroad for international trade between Eastern Africa, the Indian Ocean, China, and Europe. This has turned this island into a place where different cultures cohabit harmoniously. 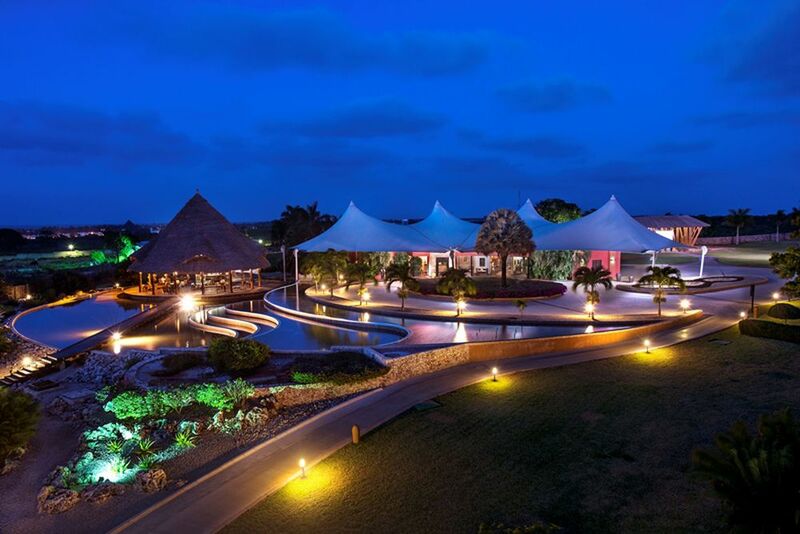 The 5-star luxury hotel is located near Nungwi and about 60 kilometers from Stones Town. 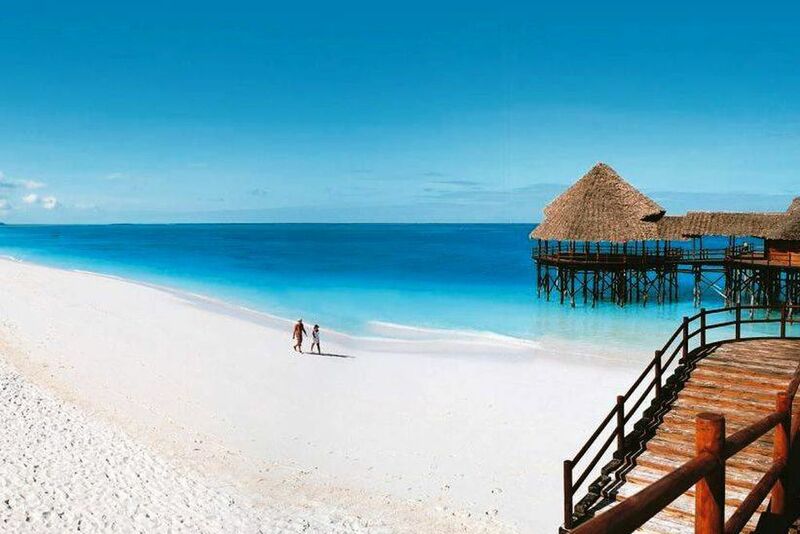 Zanzibar Airport is about 1 ½ hours away. Operating under a high standard of luxury, the resort offers a business center, saline pool, gym, beach with facilities, spa, 5 bars, 4 restaurants and much more to ensure a wide range of services to fulfil your every need. The main restaurant, Pavilion, is open for breakfast, lunch and dinner, serving delicious Mediterranean cuisine. The restaurant organizes theme parties each week. The Coral Cove Pizzeria is located by the pool and invites you to taste the fresh and delicious pizza from the brick oven. Savor in first-class fish specialties at the open-air restaurant, The Beach Grill. How about a romantic evening with your significant other? The Sea Breeze À La Carte Restaurant sits on stilts above the sea and spoils guests with the finest meat and fish specialties. Apart from the beach bar at the pool, try the Lobby Lounge, Rock Bar and Moresco Café for delicious cocktails, specialty wines and small snacks. The bars also offer water pipes, oriental coffee and thick oriental carpets for a genuinely unique atmosphere. Discover the special Sunset Lounge & Bar that is situated on the pier and offers unforgettable sunsets complemented by live music and fruity cocktails. There is a large pool area with a separate children’s area and a beautiful sun deck for relaxing days beneath the inviting sun. Other hotel amenities include a boutique, a concierge service and a varied entertainment program. 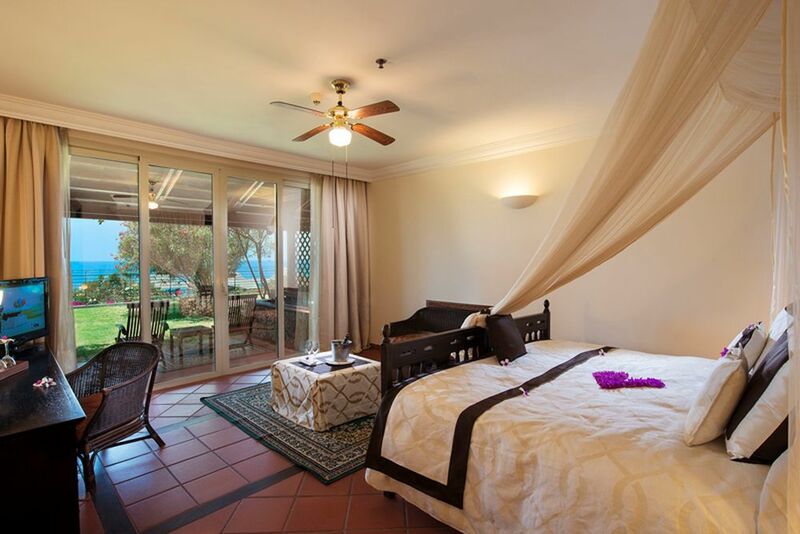 All 138 comfortable furnished rooms and suites offer impeccable sea views, a private terrace, a large double bed or two twin beds with mosquito nets, and an in-suite bathroom for a relaxing holiday. Other amenities include a fan, tea/coffee making facilities, and a minibar that is refilled daily. Villa Club Room (30 sqm)— Distributed on several terraced buildings, each complex features a shared living room where fellow guests of the resort can meet and share their holiday experiences! 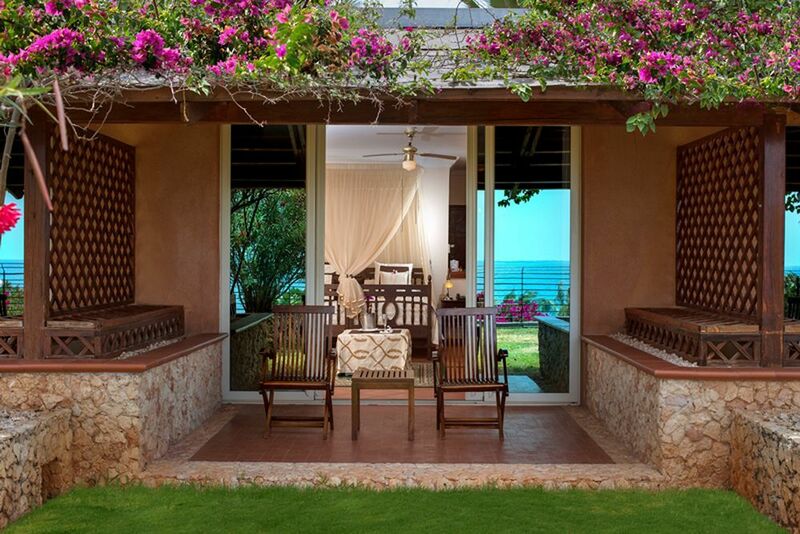 Deluxe Room (32 sqm)— Boasting sea views from the private terraces, these rooms have direct access to the tropical gardens. Suite (60 sqm)— Enjoy glistening ocean views, a double bedroom, a separate living room and a corner kitchen for the ultimate beachfront getaway! Other suites available upon request. Mvua African Rain Spa’s concept balances your body and senses in an oasis of tranquility. Pamper yourself by the skillful hands of the experts at the wellness center. Not only can you choose from an array of unique treatments, but it is complemented by the African landscape in a relaxing and welcoming environment for a precious experience. Wish to stay active even whilst on vacation? Water sport enthusiasts can explore Zanzibar’s magnificent aquatic wildlife, book diving excursions at the diving center, or take a course or lesson of the island’s most popular water sports! Included with hotel rate: canoeing, water aerobics, beach volleyball, table tennis, and tennis. Spend your honeymoon in the Diamonds La Gemma dell'Est.